If I had to do it all over again, well, I wouldn’t have fiddled with the GPS for 10 minutes. I wouldn’t have dawdled at the visitor’s center. I would have ignored the speed limit. However, mostly, I would have checked out the ferry schedule. I woke early enough and walked to Avis in downtown Seattle where I was hooked up with a Ford Edge, a car I’d never heard of that was really comfortable and had nice amenities. I wanted a car that would handle mountain climbs and was roomy enough to travel with the kids and all their peripherals. We had ample space for our luggage, but because I had borrowed the GPS from my NY-based ex, I had trouble plugging in the first address (it kept trying to find Anacortes, NY). Our itinerary for the day was San Juan Island, specifically Friday Harbor, which had been recommended by cousin-in-law Doug. What Doug failed to mention was that if I missed the 11:55 a.m. ferry, I wouldn’t be getting to San Juan Island. I’m from New York City, and I wrongly assumed that one ferry is pretty much like any other and that they would depart at regular intervals. I had no intention of putting my car on the boat, so when we got to the parking lot and saw a ferry in the dock, I didn’t really rush to get on it. This was a mistake we paid for. 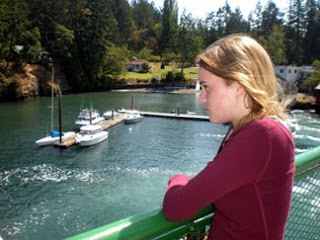 The 12:30 ferry didn’t go to Friday Harbor, terminating at Orcas. The next Friday Harbor ferry was three hours away, and since I had little choice, we hopped the boat to Orcas in hope of a good day trip or at least an adventure. 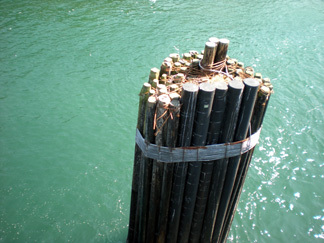 A Heron’s nest on moorings near Lopez Island. Colossal mistake #2 involved trying to get food from the ferry kiosk. We had planned to grab lunch at FH, but Orcas seemed less promising on the lunch front. Thus it was I spent almost 40 minutes in line waiting for undercooked chicken tenders and soggy fries (the chowder was good, but by the time I got the rest of my order, it was room temp). Finally fed, we ventured out onto the chilly deck. Although the record heat had followed us to Anacortes, the trip to Orcas (by way of Lopez and Shaw Islands) was quite cold. However, the waters weren’t accommodating for whale watching. Other than a random gull, we saw no wildlife in the clear waters. The best offerings were the herons in and around the decks at the various ferry stops. I was not in the greatest mood at this point, so perhaps I didn’t appreciate the beauty of the trip thus far. The islands were quaint, but certainly didn’t live up to the reputation or the guidebook description. I was expecting paradise, and what I found was less than idyllic. That said, Orcas was even worse than that. Home to approximately 5,000 residents, the island is allegedly considered one of the most beautiful of the San Juans. However, where the ferry drops is pretty much the middle of nowhere. And not in a good way. What Orcas lacks in amenities it more than makes up for in “keep out” and “no trespassing” signs. Want to check out the beach? Fuhgettaboutit! How about that nice trail through the woods? It’s private, keep out! My overall impression of Orcas was a place where paranoid unhappy people are hunkered down waiting for the Apocalypse. 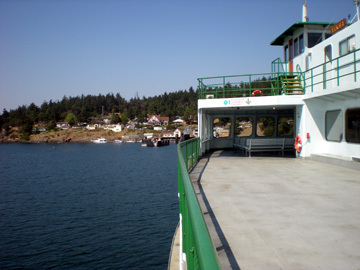 The Orcas brochure proclaimed, “Orcas Village is the arrival point for the Washington State ferry. Here you’ll find gift shops, a grocery store, a post office, lodging, restaurants and outdoor activities.” Well, the grocery store was nice. The gift shop was closed. The onlyrestaurant was sweltering (kids weren’t allowed on the deck, so we sat in a greenhouse-like structure and sweated). The “outdoor activities” were limited to a park with working toilets. At least the loo was clean. The one exception to the universal “leave us the hell alone” approach to tourists was at a small sheep farm about two miles north of the ferry landing on Orcas Road. Warm Valley Orchards had a “visitors welcome” sign and we were happy to tour Maria’s studio (open on the honor system; obviously Maria isn’t an Orcas native with that outpouring of trust). Although the exquisitely knitted offerings were outside my price range, I did plunk down two bucks for two overripe but delicious plums. The price was actually $2/pound, but I was overly generous owing to the opportunity to get off the road and see a bit of the forest along with this farm being the only spot open to tourists for miles. We spent the last hour of our “visit” in the park, my daughter reading her AP English assignment, my son playing his DS, and me looking through my Washington State guidebook anxious to move to our next location. In all fairness to the island, even the guidebook said the best areas were several miles inland. That said, I – a New York City resident!!! 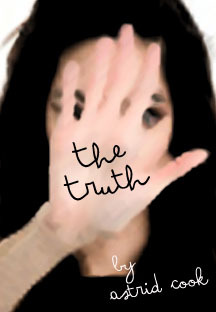 – have never visited a place less hospitable to potential visitors. 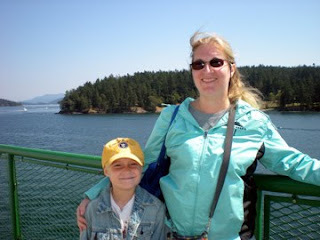 My advice to anyone coming for a visit would be either bring a car or don’t miss the earlier ferry to Friday Harbor! Goodbye, Orcas! We weren’t welcome here! The ferry back was shorter and uneventful. The best to be said about it was the amazing views of Mt. Baker. I had considered early on heading out to the north Cascades and doing the Mt. Baker Highway. However, that morning I had used Priceline to get a hotel in Oak Harbor, which was roughly halfway between the San Juans and the ferry at Keystone that would get us to the Olympic Peninsula. Interestingly, none of my potential itineraries included Olympic National Park, but Laura had recommended it and now I was in close proximity (assuming no more ferry mishaps). Perhaps it was the tiring day or the lackluster hotel in Seattle, but the Coachman Inn seemed more like a five-star hotel at that point. The air had cooled considerably, and the outdoor pool was heated to 90 degrees. Zorba’s across the parking lot served up delicious (and inexpensive) roasted lamb, along with other Greek and Italian specialties. And the mattresses were so soft (in a good way) that you literally sunk into them. A long day and errant journey made right in the end.